Remove temporary protective storage clip and insert cartridge into your printer. NOTE: “Empty” and “Low Ink” alerts are COMPLETELY NORMAL for all HP 350, 350XL, 351 & 351XL ink cartridges which have been refilled! While at first this may be an unusual workflow, it does allow print operations to proceed. 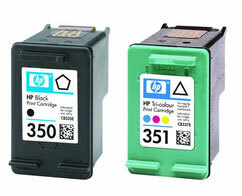 Your printer/computer may display an ink alert message, such as “non-genuine cartridge”. Press proceed/continue/accept/yes/OK to dismiss this prompt. After refills, the printer cannot track the ink level. The ink level indicator will falsely signal empty. In many cases, additional nuisance messages may also appear – this is normal. Bypass all low ink warnings and nuisance alert messages.